Despite what you may think, we do do other things besides work on our home. One of those things I like to do is make my man happy and one way to do that is by filling his tummy with yummy. Josh’s birthday was this past week and we were able to celebrate with family and friends at our house yesterday. I shouldn’t of even asked Josh what his birthday dessert request was because I already knew. 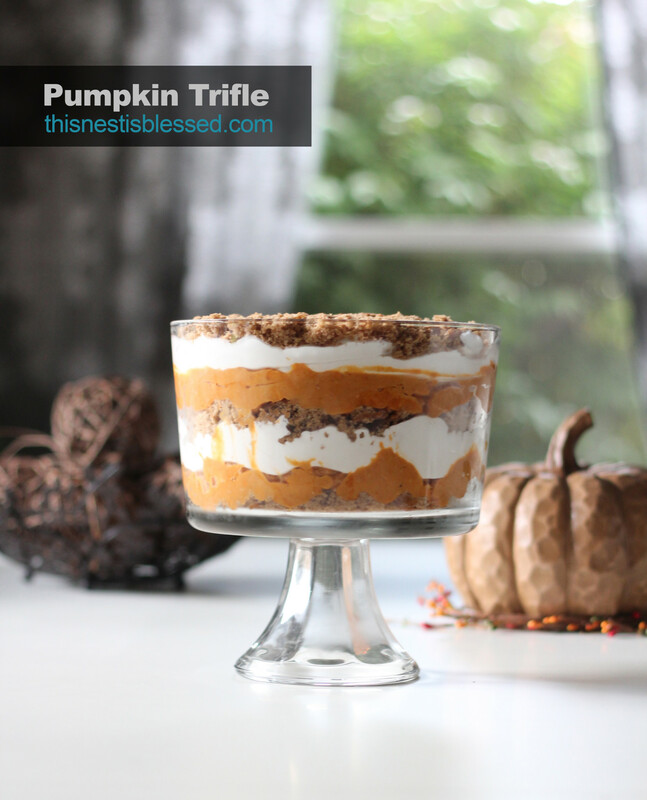 Pumpkin Trifle. Or Pumpkin Triflin’ as Josh somehow came to call it last year when he first discovered his love for this delicious dessert. The funny thing is, (which is NOT actually funny to me at all) that I was stuck making this dessert at 2am the night before the party. I’ll spare you the details, but I literally did not have time to make it before then. I felt like I was back in college, the only difference is that my roommates and I would of not only been making it at 2am, but eating it at 2am too. Since the Triflin’ is the birthday boy’s favorite and went over so well at the party I thought I’d share the recipe with you. Admittedly, the recipe is not my own creation but one slightly adapted from Taste of Home. Combine cake mix, water and egg and beat together with hand mixer. Pour into ungreased 8-in. square baking pan. Bake at 350° for 35-40 minutes. 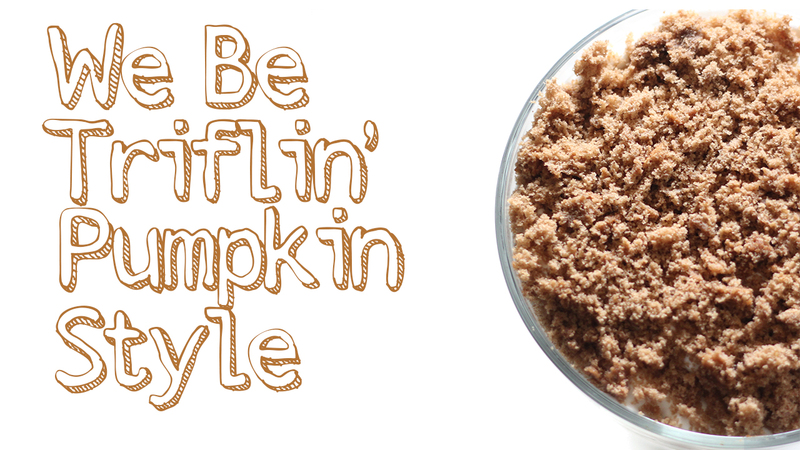 Let cool and then crumble the cake (that is the fun part). Whisk milk and pudding mixes until thick. Stir in pumpkin and spices. Layer in a trifle bowl as follows: 1/4 of cake crumbs, 1/2 of pumpkin mixture, 1/2 of whipped topping, then repeat and end with cake crumbs on the top (I had cake crumbs left over FYI). Be sure to refrigerate if you won’t be eating it right away! So next time you’re in a pumpkin-y mood or have a husband with a fall birthday I highly suggest making this Triflin’. Speaking of husband’s.. thank you to J for taking and editing the awesome Pumkin Triflin’ pictures seen above.